Sometimes there are words that you are not allowed to use due to your company's compliance regulations. You can add them to your Compliance List and Atomic Reach will let you know whenever you include any of these words in your writing. Add and manage words in the Compliance List. 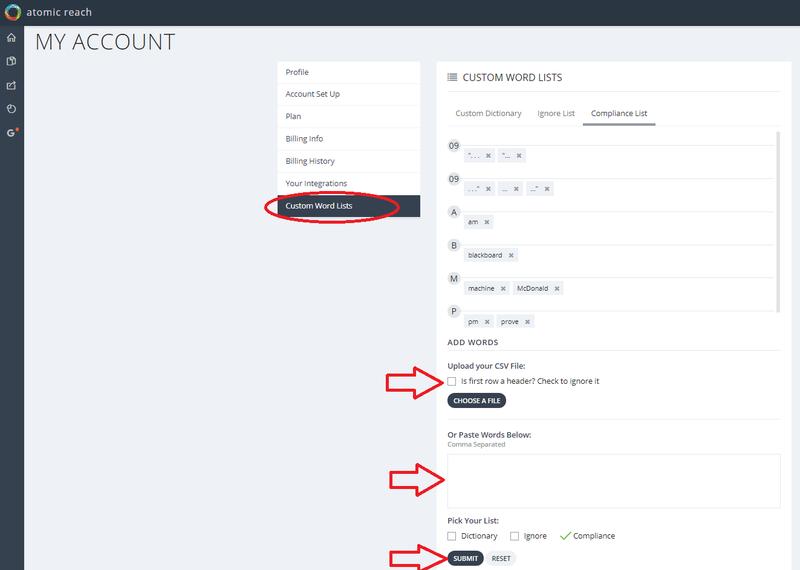 Step 1: Go to your account settings and click on Custom Word List. Step 2: Under Compliance List, you can upload your compliance list via a CSV file or simply type/paste them into the box with words separated by commas. Tip: Make sure the correct list is picked when uploading your CSV. Step 3: Words that are part of your compliance list will be double-underlined in Atomic Content.